Organic parsnips. One of the joys of winter: sweet, gutsy and very easy to cook. They taste even better after the first frost – the cold weather converts some of the starch to sugar, increasing the sweetness. Delicious roasted, blended into a soothing soup, or adding sweet crunch to raw winter salads. Their flavour is easily lifted by all sorts of spices. Roasting intensifies the sweetness of parsnip to tender, caramelised sublimity. Enjoy alongside a roast, with other root veg, feta cheese and lentils, or add to a winter salad. Parsnips also boil or steam well. For serving as a side with melted butter and fresh herbs – or for mashing, puréeing or mixing with greens and frying in patties as a seasonal twist on bubble and squeak. Store for 2 or 3 weeks on a cool veg rack or in the bottom of the fridge. Our season runs from November to April. They’re at their very best between December and February. 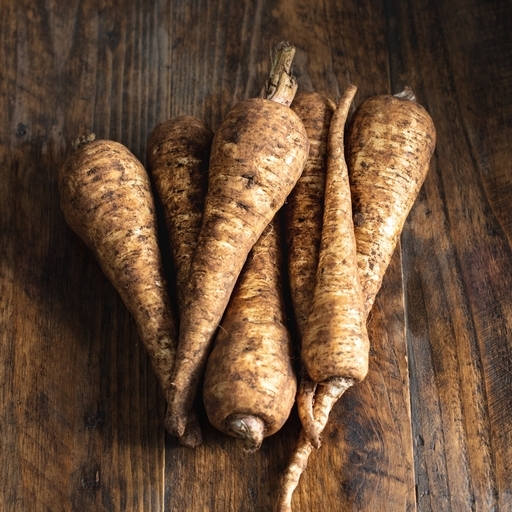 We grow parsnips on all our Riverford farms.